Home / media / Microimage Mobile Media showcase mStudio 3 – Radio Automation Solution at the inaugural broadcast technology show in Indonesia. Conducts a focused seminar for mStudio 3.0 with Radio Broadcasters in Indonesia. 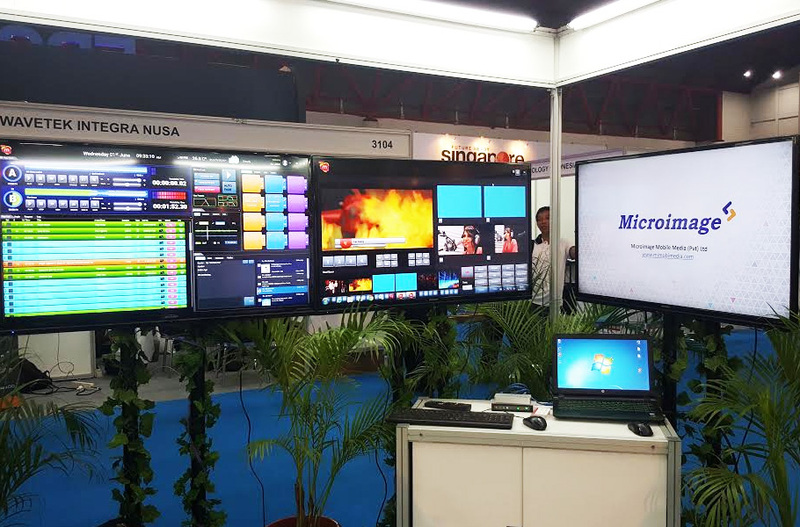 Microimage Mobile Media, Sri Lanka’s leading and perhaps the only Broadcast, software Technology Company featured its flagship solutions at Broadcast Indonesia 2016 at the Jakarta International Expo from 31st August to 3rd of September. The latest version of Microimage mStudio, the flagship radio automation solution offers radio broadcasters the capability to redefine the way radio is experienced by listeners. The new version takes radio to a distinctive level by enabling broadcasters to do simulcast both audio/video combined. Radio Listeners can experience radio like never before with the ability to watch live video broadcast with interaction using their smart mobile devices. Broadcast Indonesia 2016 was a highly focused one stop event. Together with Communic Indonesia 2016 it is the only integrated event in Indonesia providing the perfect opportunity to meet face to face with potential clients who actively look for suppliers for pro-audio, film and broadcast solutions. The event took place at The Jakarta International Expo, Kemayoran, in Indonesia. Microimage Mobile Media’s latest version mStudio brings Visual, Mobile and Social capabilities to radio broadcasters. Radio stations now can combine video and deliver a rich experience to listeners who now have the ability to engage using mobile & social technology. “Indonesia is a very large market for broadcast technology and we are absolutely thrilled to share our latest Radio Automation Solution – mStudio 3 which redefines the radio listening experience to listeners. “Today, we are in the era of digital transformation, and radio broadcasters need to reinvent the way they distribute their content and engage with their community. mStudio 3.0 offers an array of functionalities not only to listener’s experience of the station but to advertisers as well”, Purasinghe further stated. The latest version also allows stations to offer a new dimension in radio advertising by offering a unique product to all their clients. The advertisers now can leverage the enhanced video and interactive advert capabilities offered through the product where the listeners can experience over their smart mobile devices. The new platform releases functionality for media scheduling, interactive advert scheduling and new play out console which allows audio/video simulcast with integration to social channels such as facebook /twitter. Originally unveiled in 2004, mStudio is perhaps Asia’s first comprehensive radio broadcast automation platform. Since then the product has grown from strength to strength where it’s deployed with a number of Asian radio stations in Sri Lanka, Malaysia and in Brunei. Microimage distribute its product in the region in partnership with Rentak Setia Sdn Bhd based in Malaysia. Rentak Setia together with Microimage Mobile Media conducted a seminar on the latest mStudio product to number of radio broadcasters in Indonesia. Microimage Mobile Media operates through partners, and the strong partnership with Rentak Setia enables the company to market, distribute, implement, integrate and support their clients out of Kuala Lumpur & Jakarta. Apart from showcasing mStudio 3.0 – the latest radio automation which offers visual, mobile and social capabilities, the company also showcased the other key broadcast technology platforms at this flagship event. The other significant highlights include vStation – the comprehensive advert insertion platform.